WorldRemit, a leading online international money transfer company has seen a 20% increase in transactions sent to cash pick up locations in Zimbabwe in the first two weeks of October (compared to the same period in September). The recent surge follows consistent growth in WorldRemit transactions to cash pickup locations over the last year since the company enabled Zimbabweans living abroad to send money home for collection as cash in USD. In November last year, WorldRemit began working with partners such as Steward Bank to guarantee cash for recipients of transfers sent for cash pickup through its app or website. 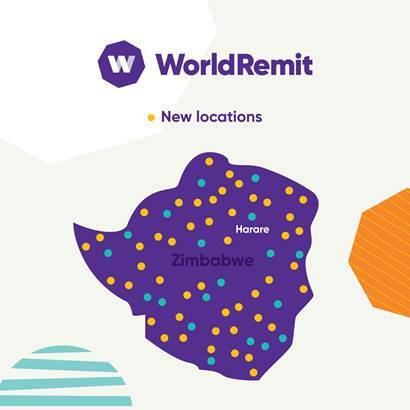 Building on this foundation, to make it easier for recipients of money transfers sent through WorldRemit to collect cash, the company has significantly increased its cash pick up network in Zimbabwe and now boasts the widest network of cash pickup locations in the country. Over the last 6 months, WorldRemit has added 10 new cash pickup partners to its global network providing an additional 150 new locations where recipients of remittances can collect cash in USD – with payments paid out in full. The network expansion means that WorldRemit offers cash at over 200 locations – more than any other remittance service. Guaranteed cash is available at Steward Bank, Kaah Express,Quest Financial Services, and ZB Bank. Transfers to cash pickup locations are instant and, because both senders and recipients receive notifications with details of how much money has been sent, WorldRemit offers complete transparency. “More people are seeing the benefits of sending with us and the number of customers sending to our cash pickup partners has more than doubled in the last year and we’re still seeing strong growth. Recommendations have been crucial to our growth, so we are also rewarding existing customers who recommend our service with the opportunity to earn $20 for both themselves and the friend they have introduced to the service,” added Mujakachi. By helping dollars get into the country WorldRemit hopes to keep trade flowing and businesses afloat – keeping that money in circulation within Zimbabwe. Surprisingly you saying expanding yet on the current branvhes when you go to receive your cash they say don’t have the money. For example Fiirs street, Joins even Hebert Chitepo.